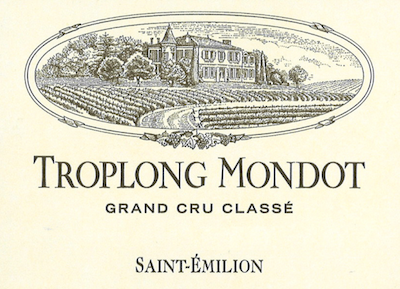 Château Troplong Mondot is a St. Emilion Premier Grand Cru Classé property that has in the last decade been producing wines that are the equal of many 1er Grand Cru Classé estates. Its handsome château dates back to 1745 and Troplong-Mondot was originally part of one sizeable domaine which included the vineyards of Château Pavie. It became autonomous in 1850 when it was acquired by Raymond Troplong. Later on, it was bought by Alexandre Valette and today it is owned and run by his great-granddaughter, Christine and her husband Xavier Pariente. Troplong Mondot has 30 hectares of vineyards well-sited alongside the hill of Mondot to the north-east of the St-Emilion appellation. The soils are rich in limestone clay and they are planted with Merlot (90%), Cabernet Franc (5%) and Cabernet Sauvignon (5%). The grapes are hand-harvested and then fermented in temperature-controlled, stainless steel tanks. The wine is then aged in oak barriques (75% new) for 18 months. It is bottled unfiltered. Guru oenologist Michel Rolland has been a consultant at Troplong Mondot since the mid 1980s.